Correction: Not a fix. See updates below (May 21, 2009). 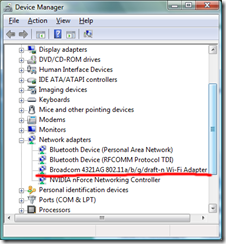 My HP Tablet PC (tx1220us) had the problem of not recognizing the wireless adapter hardware for a couple of weeks so I've been unable to connect to the Internet wirelessly. 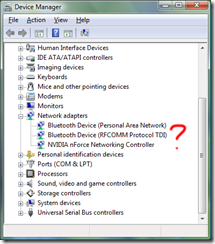 The Device Manager didn't show any wireless network card hardware at all, and the problem comes and goes with each shutdown. I think the problem was introduced in one of the later BIOS updates (F.1X). I was about to send my tablet back to HP for repair, and I'm glad I waited a while. I just updated to the latest version (F.20), and it seems to have fixed the issue. You might also be interested in the other software updates. NOTE: This BIOS update seems to be specific to the tx1220us. Check before you update your tablet. UPDATE 1: The BIOS update did not fix the problem after all. I found a forum thread about the same issue with other HP models here. I'm about to try a solution suggested by one of the users. UPDATE 2: None of the suggested fixes worked. I will need to send my notebook back for repair. UPDATE 3 (June 17, 2008): As a last-ditch effort, I tried turning it off and removing components (battery and DVD-drive), and after removing the DVD-drive and putting it back in, the wireless network adapter is back. It has survived several shutdowns so far. I would like to hear from anyone who tried this method specifically. Please leave a comment if it works (or not). UPDATE 4 (June 22, 2008): It didn’t last very long, unfortunately. I’m back to wired Internet access for now, and I’ll have to make arrangements to get it repaired by HP. UPDATE 5 (July 23, 2008): I downgraded the BIOS (F.1C) to see if it works, but it didn’t result in anything fruitful. 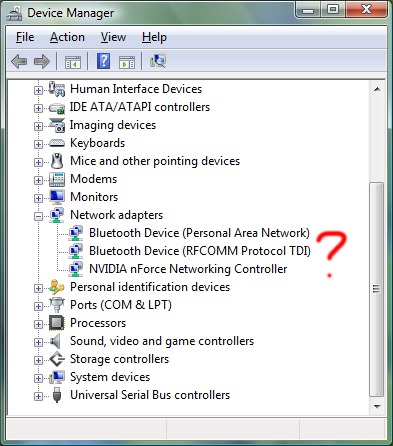 The wireless adapter still disappears. UPDATE 6 (September 9, 2008): My tx1220us is undergoing a motherboard replacement. What’s interesting about this whole ordeal is HP Support’s genuine blindness or lack of care. I am leaning 90% towards the latter. This blog post is the most popular entry page on my blog based on Google queries. That tells me that this wireless problem is very widespread. I would expect HP’s tech support to be very aware of this problem by now, but seems that isn’t the case. It’s either real ignorance or total disregard on their part. I suspect they don’t want to acknowledge this as a failure of the tx1000 series technical design. My HP customer service status as of today literally reads: “Failure : SERVICE ENHANCEMENT PROGRAM.” That sounds about right, HP. Deep down you do know where you failed. UPDATE 7 (September 16, 2008): HP has redeemed 10% of itself. I got my tx1220us on time; motherboard and display replaced. I don’t exactly know why the display was replaced, but it is a welcomed replacement. So far, so good. 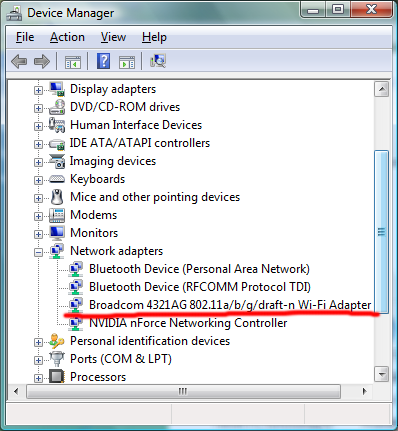 The wireless adapter is present. UPDATE 8 (January 22, 2009): It’s been a few months since HP repaired my tablet, and I’m glad to say that my wireless adapter is still working. UPDATE 9 (May 21, 2009): The inevitable has happened. My wireless card began to disappear again from the Device Manager, and I’m sending it back for repair. HP’s response: You can’t expect it to last forever. Of course I don’t, but requiring repair less than a year after it was bought is unacceptable, and requiring yet another repair a year after that is also unacceptable. HP, you can’t expect me to do this every summer. This isn’t “speculation.” My extended warranty ends in 2010. What then?